Gibb Tools are a leading specialist tool supplier to the industrial and retail sectors in Aberdeen. Our main but not exclusive business is the supply of engineering tools to the North Sea oil industry. Gibb Tools was established in 1933 and traded as a retail outlet until the 1970's when the oil industry arrived in Aberdeen. Since then the oil sector has become an increasingly important part of our business and we have changed our stock profile to reflect this. Large in-house stock combined with high quality service has meant fast growth over the last decade. Our service quality is endorsed by ISO 9001:2000 and 1st Point Assessment accreditation. 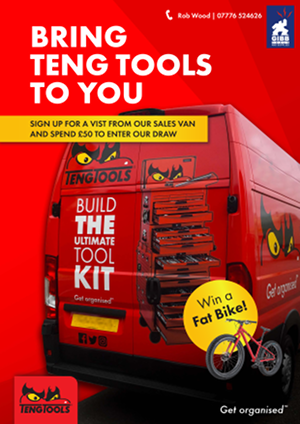 Enter the Teng Tools van raffle for a chance to win a fat bike. Call Rob on +44 7776 524626 for details.